July 14, 2014 – After an 8.5-year journey, NASA’s New Horizons spacecraft is only one year away from its closest encounter with Pluto. 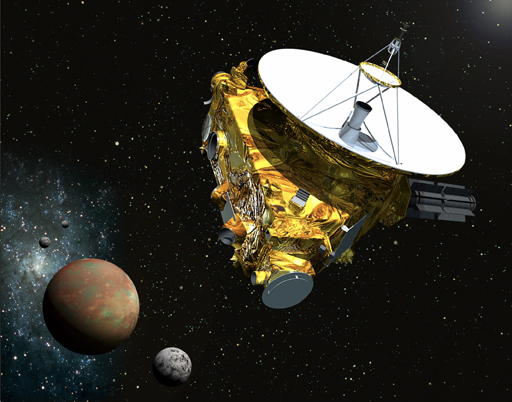 The probe is expected to be about 6,000 miles from Pluto on July 14, 2015. The New Horizons Pluto-Kuiper Belt mission is being led by Principal Investigator Alan Stern of the Southwest Research Institute (SwRI) in Boulder. The main goal of the New Horizons mission is to perform high-quality scientific investigations of the Pluto-Kuiper Belt region of the solar system. Pluto and the Kuiper Belt are known to be endowed with carbon-bearing molecules and water ice, the raw materials out of which life evolves. As the New Horizons spacecraft passes through this icy region, it will use its science instruments to photograph and explore Pluto, its moons, and Kuiper Belt Objects. Our current knowledge about Pluto is based on observations taken from the ground and Earth orbits. This mission is historic because it will be the first time a human spacecraft has visited the icy planet, and the first exploration of a new planet since the Voyager missions more than 30 years ago. Pluto has a half-sized moon, Charon, which was discovered in 1978. More recently, it’s smaller moons, Nix and Hydra, were discovered. Charon is half the size of Pluto and doesn’t orbit Pluto in the way that our moon orbits the earth. The gravitational balance point of Pluto and Charon lies between the two masses and is known as the Pluto barycenter. The design of the Pluto-Charon encounter trajectory will allow observation of both bodies in a single flyby by multiple instruments and coordinated measurements of the Earth, Sun, Pluto, and Charon. The outer space beyond the orbit of Neptune is referred to as the Kuiper Belt. Gerald Kuiper hypothesized in 1951 that short-period comets orginate from a collection of material left over from the formation of the solar system. David Jewitt and Jane Luu proved the theory in 1992 with the discovery of the first Kuiper Belt Object. Since then, over 1000 Kuiper Belt Objects have been identified. Plans for an extended mission include one or two encounters of Kuiper Belt Objects, ranging from about 25 to 55 miles (40 to 90 km) in diameter. Hubble has been given the task of identifying one of more candidates to visit. New Horizons made a close flyby of Jupiter in February 2007 in order to get a gravitational boost enroute to Pluto. New Horizons suite of science instruments was successfully exercised and data and images from Jupiter were returned to Earth. In addition to SwRI, the mission team includes Ball Aerospace Corporation, Lockheed Martin, University of Colorado, the Boeing Company, NASA Goddard Space Flight Center, NASA Jet Propulsion Laboratory, Stanford University, KinetX Inc., the U.S. Department of Energy, and a number of other firms, NASA centers, and university partners.